DUNMORE Corporation announces that its DuPont™ Kapton® polyimide film-based multi-layer insulation films and polyimide tapes will be used to protect NOAA satellite DSCOVR from the thermal dangers of space over its five-year mission. In September 1999, NASA's Inspector General recommended the Triana satellite project be put aside due to budget constraints. The $100 million satellite was placed into storage in 2000. Later, it was renamed the Deep Space Climate Observatory: DSCOVR. Now, DSCOVR has been refurbished and launched earlier this week. 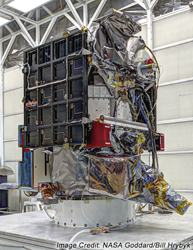 Multi-layer insulation films and polyimide tapes from DUNMORE Corporation will protect critical satellite components from the thermal dangers of space over its five-year mission. DSCOVR, launched from Cape Canaveral Air Force Station in Florida, is a joint mission between the National Aeronautics and Space Administration (NASA), the National Oceanic and Atmospheric Administration (NOAA) and the U.S. Air Force. The Air Force has contracted with SpaceX to carry the satellite to orbit using a Falcon 9 launch vehicle. It will fly nearly one million miles from earth - far higher than most satellites - to a position known as the L1 Lagrangian point, a position where the gravitational pull from the sun and Earth essentially balance, allowing DSCOVR to orbit the sun within Earth’s orbit. DSCOVR has two mission objectives. The first is to monitor space weather caused by coronal mass ejections and solar storms that interfere with modern technology. Communications satellites in high earth orbit are especially at risk from the influx of x-rays and high energy protons that form the extreme solar winds associated with coronal mass ejections (CMEs). The array of two dozen Global Positioning Satellites (GPS) are also at risk, endangering aircraft and ground-based navigation. Solar storms can also induce high electrical currents in utility power lines, potentially crippling large areas of the planet. Experts project an extreme solar storm could result in one to two trillion dollars damage and could require a decade from which to recover. DSCOVR is expected to provide an hour or more early warning of solar storms, giving those responsible for maintaining and protecting vulnerable technology the time needed to take appropriate action. DSCOVR is also tasked with monitoring solar energy reaching and being reflected from Earth, as well as monitoring the planet's atmosphere for concentrations of aerosols, ozone density, ultraviolet radiation and other factors that affect Earth's climate. DUNMORE's multi-layer insulation films (http://www.dunmore.com/products/multi-layer-films.html) and polyimide tapes (http://www.dunmore.com/products/polyimide-tape.html) made with DuPont™ Kapton® polyimide film protect the satellite's propulsion system as well as two critical subsystems: the Earth Polychromatic Imaging Camera (EPIC) system, and the National Institute of Standards and Technology Advanced Radiometer (NISTAR) system. Since early days of SpaceLab, DUNMORE has been proud to serve as a trusted manufacturer supporting space exploration, spacecraft and satellite programs around the world by engineering materials to address critical overheating problems, with continuous advances in the technology and manufacturing of multi-layer insulation (MLI) films, tapes and electrostatic dissipative (ESD) films (http://www.dunmore.com/products/esd-protection-film.html). Nearly all of the MLI materials use DuPont™ Kapton® polyimide film. This substrate has set the industry standard for 50 years in high performance, reliability and durability, with a unique combination of electrical, thermal, chemical and mechanical properties that withstand extreme temperature, vibration and other demanding environments. DUNMORE Corporation is a global supplier of engineered coated and laminated films and foils. DUNMORE offers film conversion services such as coating, metalizing and laminating along with contract film manufacturing. DUNMORE produces coated film, metallized film and laminating film substrates for the photovoltaic, graphic arts, packaging, aerospace, insulation, surfacing and fashion industries. DUNMORE is privately held, ISO 9001:2008 and OSHA VPP Star certified. For complete information on DUNMORE’s products, services and industries served, please visit DUNMORE’s website http://www.dunmore.com/. DuPont™ and Kapton® (http://www.kapton.com/) are a trademark and a registered trademark of DuPont or its affiliates.